For about a month now, students at SHS have been counting down the number of days left in the school year. Leading the efforts have been several seniors who have posted the progress on the blackboards of several classrooms. Why are these students so anxious to graduate? The answer probably does not lie with the quality of the school for several reasons. 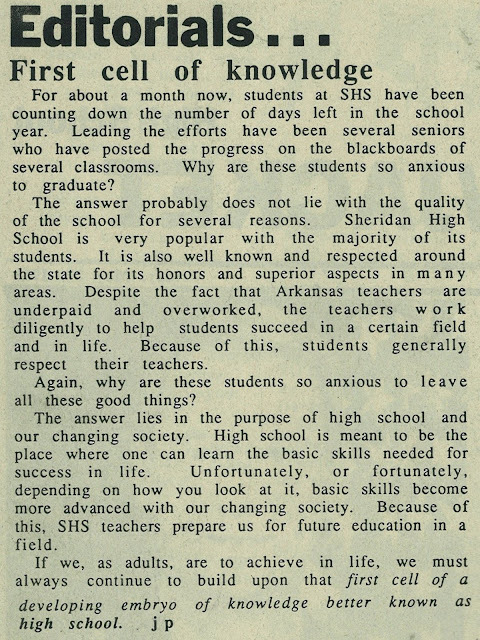 Sheridan High School is very popular with the majority of the students. It is also well known and respected around the state for its honors and superior aspects in many areas. Despite the fact that Arkansas teachers are underpaid and overworked, the teachers work diligently to help students succeed in a certain field and in life. Because of this, students generally respect their teachers. Again, why are these students so anxious to leave all these good things? The answer lies in the purpose of high school and our changing society. High school is meant to be the place where one can learn the basic skills needed for success in life. Unfortunately, or fortunately, depending on how you look at it, basic skills become more advanced with our changing society. Because of this, SHS teachers prepare us for future education in a field. If we, as adults, are to achieve in life, we must always continue to build upon that first cell of a developing embryo of knowledge better known as high school.